Pumpkin pie is one of the most popular desserts in the United States and Canada. It is typically cooked during the fall and winter. There even is the National Pumpkin Pie Day observed on December 25. The pumpkin is indigenous to the continent of North America therefore pumpkin pies can be considered truly America's pride. Pumpkin pie consists of a pumpkin-base custard baked in a single pie shell, it rarely has a top crust. It is usually flavored with ginger, cinnamon, nutmeg, and cloves. You can also use canned pumpkin or packaged pumpkin pie filling that already contains spices for baking the pie. Pumpkin pie is often made for Halloween, Thanksgiving and Christmas. 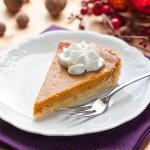 As pumpkin pie is typically baked in the fall when pumpkins are harvested, many companies produce seasonal products with pumpkin pie flavor, such as coffee, ice cream, cheesecake, candy, pancakes, and ale. For instance, Starbucks is famous for its Pumpkin Spice Latte. It is interesting to know that the largest pumpkin pie in the world was created in New Bremen, Ohio in 2010. It measured 20 feet in diameter and weighed almost 3,700 pounds. The cooks used 1,212 pounds of canned pumpkin, 525 pounds of sugar, 233 dozen eggs, 109 gallons of evaporated milk, 14,5 pounds of cinnamon and 7 pounds of salt.